The textbooks include Arabic and English grammar books. 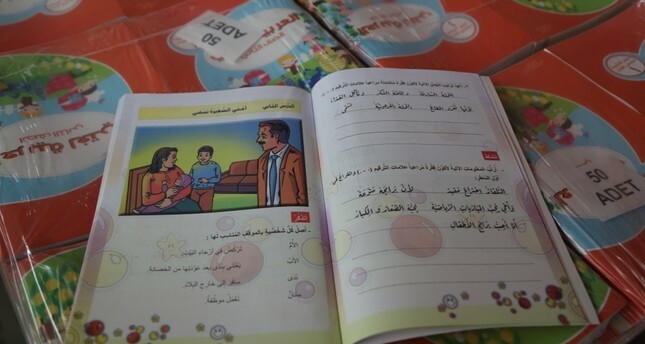 Boosting its role as the main country helping Syrians shape their future in areas liberated from terror, Turkey delivered textbooks it printed for schools in Syria. Turkey's National Education Ministry has sent 3.6 million textbooks to schools in northern Syria, the ministry announced yesterday. The books were delivered to a logistics center run by Turkey's Disaster and Emergency Management Authority (AFAD) in Choban Bayk, also known as al-Rai, a small town in Aleppo province. The books will be sent to schools in Afrin, Jarablus, al-Bab, Azaz and Mare districts and Ahtarin town, areas where Turkish forces have conducted two major military operations against terrorist groups such as the PKK-affiliated People's Protection Units (YPG) and Daesh. Operation Euphrates Shield, which began in August in 2016 and ended in March 2017, eliminated terrorists along the Syrian border. On Jan. 20, Turkey launched Operation Olive Branch to free Afrin of YPG/PKK and Daesh terrorists. On March 18, Turkish troops and the Free Syrian Army (FSA) liberated the Afrin district center. Since then Turkey has been rebuilding the towns' infrastructure and health and education institutions. Schools were renovated and a hospital is being built. Turkey also helps locals build olive oil facilities in the town where agriculture is the main source of income for residents. Tens of thousands of people who fled terrorist groups in Afrin and other places returned to the towns after Operation Olive Branch and Operation Euphrates Shield.